BEND, Ore. — Four hours from the nearest surf, 4,000 feet above sea level and 4 decades removed from the days when he was known as Mr. Pipeline for deep and daring tube rides at one of the world’s most treacherous wave spots, Gerry Lopez shouldered a board beneath ponderosa pines on his way to the banks of the Deschutes River. Gerry Lopez with some of the boards he shapes in Bend, Ore. He might have made his name and reputation along Oahu’s North Shore — and in Hollywood, where he appeared in cult films, including “Conan the Barbarian” with Arnold Schwarzenegger — but Lopez has made another life here in the Cascades the past 15 years. He lives with his wife, Toni, and son, Alex, in a tidy Craftsman house next to the river, near Mount Bachelor, where snow clings to the peak through summer. He begins most mornings with yoga before driving to a shop in town to shape custom surfboards, a career that began during his heyday in Hawaii. And in spare moments, Lopez, 61, likes to glide along the green river on a stand-up paddleboard — maybe the most mellow surfing experience yet devised, and one that has expanded the sport’s reach to unlikely places and populations. You don’t need much experience, either. “With a minimum of athletic ability, anyone can get on a board and say, ‘Wow, I can do this,’ and start paddling and cover a mile before they know it without a lot of effort,” Lopez said. Pioneered by Honolulu’s Waikiki beach boys to monitor tourists during surfing lessons, riders stand upright on a long, wide board and use a six-foot paddle to propel themselves. Laird Hamilton, the big-wave surfer, revived interest in stand-up paddling — S.U.P. in industry argot — in Hawaii a decade ago. The trend soon spread to waves around the world. Now adapted to flat water, stand-up paddling has surged inland. The languid pace of surfing’s latest offshoot suits Lopez. Even during his days as the undisputed leader of Pipeline, he embodied a Zen approach. Lopez last surfed Pipeline in December during an exhibition as part of the Pipeline Masters, an event he won in 1972 and 1973. Although fit and trim, he allows that he has slowed down. He will most likely retire from surfboard shaping in a couple of years. 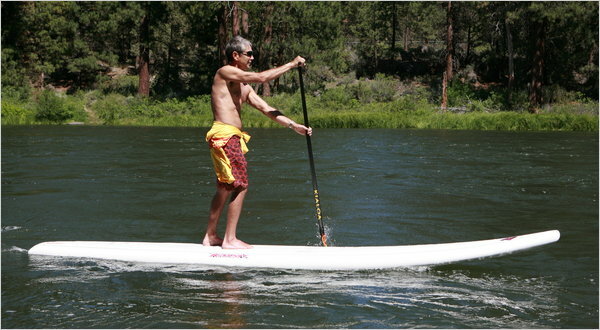 In the meantime, Lopez is riding the new wave of stand-up paddling, which has caught on here along the Deschutes, especially a section that courses beneath a footbridge through the Old Mill District in town. Folks from Lake Tahoe to the Mississippi River, and from the Great Lakes to New Hampshire’s Lake Winnipesaukee, have begun to figure it out, too. All of which has caught the surf industry somewhat off balance. “I get media inquiries from Midwest outlets asking about S.U.P. because their lakes are starting to see more and more of it,” Mandy Johnson, a spokeswoman for the Surf Industry Manufacturers Association, a leading trade group, wrote in an e-mail message. The manufacturers association says it does not have sales figures on stand-up paddling because it is so new. But three magazines cover the sport. And Action Sports Retailer, a board sports trade show held in August in San Diego, will host a stand-up demonstration this year — on a lagoon, not the ocean. Scott Bass, an early stand-up enthusiast in California, founded the Sacred Craft Surfboard Expo, an exhibition for surfboard shapers and manufacturers held in conjunction with the Action Sports Retailer show. “If you consider stand-up paddleboards as surfboards, they are far and away the best sellers,” he said.